It took me an age to pack last night in the hotel. As per usual I had emptied all the panniers as soon as I had arrived on Sunday in order to find things which obviously necessitated replacing them before I left. If only I had a memory capable of remembering where I put the item I’m looking for. It’s usually in the fourth pannier I open so perhaps I should try that one first. Yanis, the very helpful boss at the hotel (I assume he was the boss although I have no reason to say that he was; he just appeared to be the boss in a way that some people manage to do that. I can’t say I’ve ever succeeded in doing so with the people who I am nominally in charge of back at work… Stop digressing!) gave me detailed and perfectly accurate instructions as to how to escape through the north-western suburbs of Athens in order to access the coastal road that would take me to The Corinth Canal. I barely had to pause to check the map and was soon heading out of town on a similar three-lane highway to the one that I had experienced on cycling day one. Perhaps Yanis had momentarily forgotten that I was actually travelling by bike. The other things that told me that I wasn’t on the motorway were the shops, cafés, bus stops and moped users (most without helmets). Mine was firmly attached as I watch juggernaut after juggernaut thunder past me and Reggie. In fairness, most of the drivers stayed clear (the nearest was actually Italian registered) and the Greeks seem to have built a road network that is far too wide for their needs. Most of the routes had plenty of spare Tarmac to one side of the carriageway where I cycled almost continually throughout the day. If you remember from yesterday’s post I was hoping that once the motorway did indeed start the majority of heavy vehicles would use that and when I arrived in Elefsina paused to take breath and record a quick memo on the dictaphone (yes, if any of you are reading this back at work, I have borrowed one of the departments dictaphones but fear not, it will be returned in September!) but no sooner had I pressed the record button than another convoy of three of four HGVs zoomed past making my efforts to enter the world of radio reportage all but ineffective. It wasn’t for another twenty or so kilometres (after Megara) that I could finally say with certainly that the big boys had left me alone. And what a joy it was to cycle once again upon sweeping coastal roads as I had done during the first couple of hours of the trip from Sounio. Not that the scenery quite matched that of cycling day one. The coastal area that I was travelling through was predominantly industrial, much of it sadly laying idle during these times of crisis. There were sporadic places where a collection of shops and cafés made the route a little more pleasant but let’s face it, this journey is not going to be all about beautiful scenery. There will be a fair few ugly bits as well; it’s the contrast that is worth celebrating. I met my first wild dogs just outside Elefsina. They took me a little by surprise and they chased me for about 50 metres before thinking ‘sod this for a dog biscuit, I’m off back to sleep in the shade’ (in dog Greek of course). It did make me wonder what would (will) happen if these wild dogs do catch me one day. Does anyone have any experiences they can call upon to advise me as to what to do? I was able to get away quite easily as the road was flat and if I’m going downhill the escape will be even easier, but what will happen if a dog starts chasing me at the bottom of a hill? It did take quite some time for the image of me being mauled by a rabid dog out of my mind. Are they indeed rabid or am I just being over dramatic? 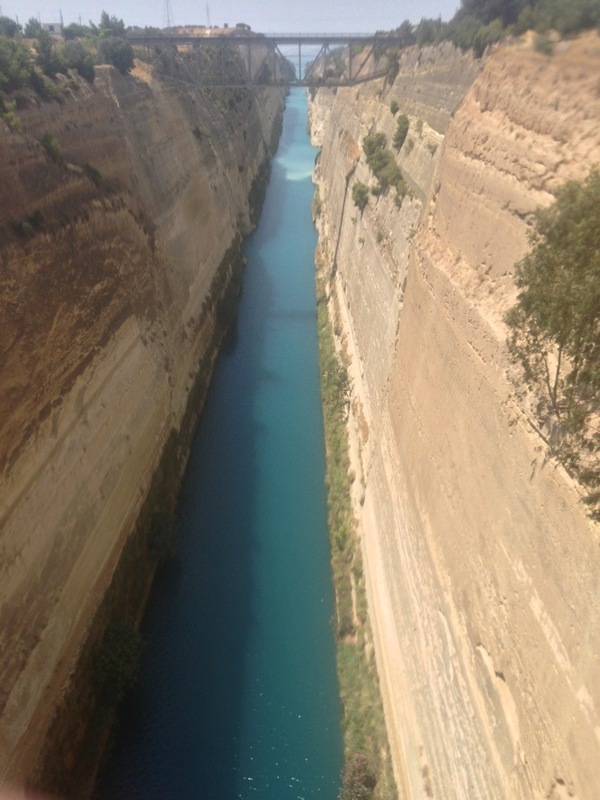 I could see from my maps when I was approaching the Corinth Canal but initially couldn’t see so much as a litre of water even at the southern end where the canal opens up into the sea at Isthmia. I did finally spot it or rather spot a luxury yacht cruising across the road in front of me. Logic dictated that I had indeed arrived. A fifteen minute pause was required before I could cross the canal at Isthmia however; another boat was coming and the bridge functioned in the same way as a level crossing. But where was the bridge? I stood and stared at where the road ended on the eastern side of the canal and across the water to where it continued on the other side. Initially I was scratching my head. The ‘bridge’ bit didn’t appear to be there. I indicated my curiosity visually to a guy behind me on a moped by scratching my head, Stan Laurel style. He was obviously a fan of the films as he then indicated with by slowly raising his arms that the bridge appeared like a James Bond villain’s underwater lair from the depths of the canal. And so it did a few minutes later. Very cool to watch! A much higher crossing further north along the canal was the ‘official’ viewing point (complete with bungee jumping experience should you choose to do so; I do hope the people who run the operation pay just as much attention to the boat timetable as do the bridge operators back in Isthmia) and it was there that I headed next to peer over the bridge, take a few snaps and pay homage to Istvan Turr and Bela Gerster who were responsible for it being built. In fairness I was the only one paying them homage as I was the only one I could see who had bothered to read the small monument dedicated to their memory just to one side of the bridge. This is the kind of annoying tourist that I am. The cycle into Corinth was quick and downhill for most of the way. It’s not a town to put on your list of must-see destinations. I’ve just cycled through it and nothing particularly enticed me to stop pedalling. Think of this as public-service blogging. I was on the look out for a campsite and I had noticed a little tent sign on a roadside map I had seen back at the bridge over the canal. I also knew of the existence of a place called Blue Dolphin Camping following a quick Internet search last night so when I saw the sign for the campsite in the place where it should have been, I yelped a little (only a little as I didn’t want to attract the attention of any stray dogs). 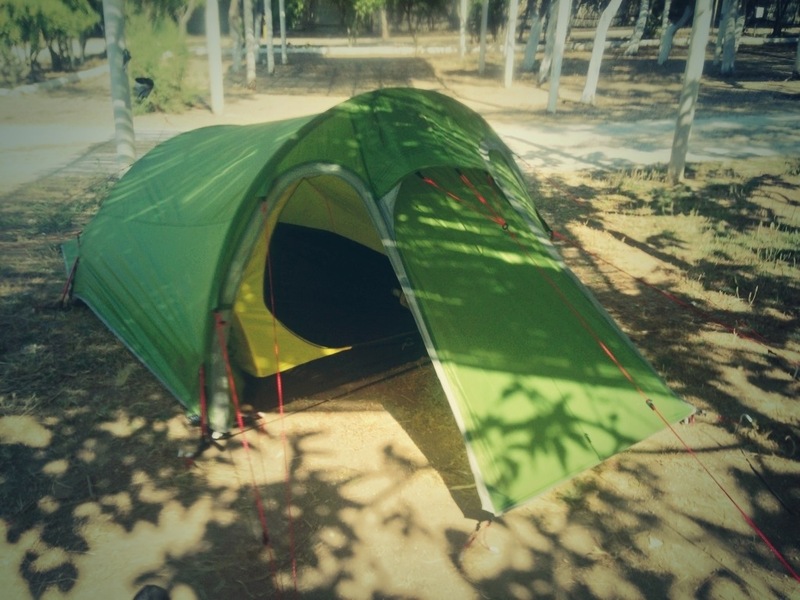 The nice lady in the reception charged me 10€ for the night and I am now a happy man with his tent pitched, a swim in the Mediterranean under his belt & a beer in his stomach. All I need now is food and a state of delirium may be invoked. Dogs were a problem for me in Albania. They didn’t just bark and bugger off though, they came up close and tried in earnest to bite. On one occasion 2 of them appeared in front of me blocking my way and one of them went round me and started harrassing me from the back. Their carefully considered plan of action was like something a wildlife documentary about wolves taking down their prey and I was very scared. I was able to pick up a large stick from the side of the road before they came too close to me. On another occasion a dog made a serious attempt to bite me and only a well connected boot in the mouth (not easy to execute such a movement on a bike) knocked it off its feet for a couple of seconds and stopped it from sinking its teeth into me. It was not interested in merely intimidating me (although it succeeded in doing that anyway) and I was only able to escape when it had recovered its composure because the road turned downhill and I could outrun it. I am considering carrying a water pistol filled with Tabasco sauce in the future. Good to hear so little has changed in riding over to Corinth from Athens. Reading your account re-kindled old memories. 1) spray with cycle feed bottle (usually use local tap water). On a tandem it’s the rear gunners job with bottle kept just for this purpose. Also works on a solo, but no dedicated bottle. 2) less friendly. If you have a cycle jersey with rear pockets, keep some small stones in them for throwing. We found that some if the dogs are very aggressive, particularly if you’re traveling up hill. Using the water option we never got bitten. Good luck and happy cycling. Sweet! Pretend the dogs don’t exist. They bark and chase to show the other dogs they are boss. peddle steadily and ride consistently and they usually just bark and eventually bugger off. NEVER up the anti by behaving aggressively, they will not always back down. Not been bit yet! Impressive stuff and that is just the start of the adventure. Greek food, mmmmmmmm, yummy!! What’s the day time temperature reaching?